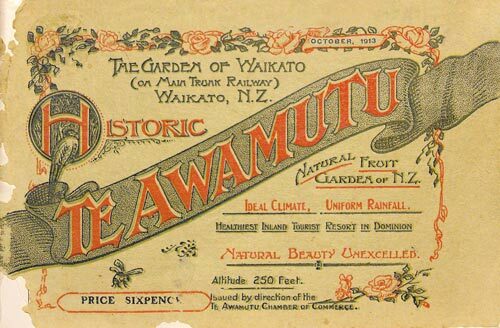 The Te Awamutu Chamber of Commerce promoted Te Awamutu as ‘the garden of Waikato’ in this forward-thinking 1913 pamphlet. It refers to the town’s history, still evident in local heritage sites and artefacts at the Te Awamutu Museum, founded in the 1930s. It also features roses, which grow particularly well in the area. Te Awamutu has rose gardens, established in the 1960s, and now calls itself ‘Rose Town’.